I am not someone with a natural "gift" for cooking. That is probably why I am getting so much joy from my successes on this blog, many of which are a process of trial and error. 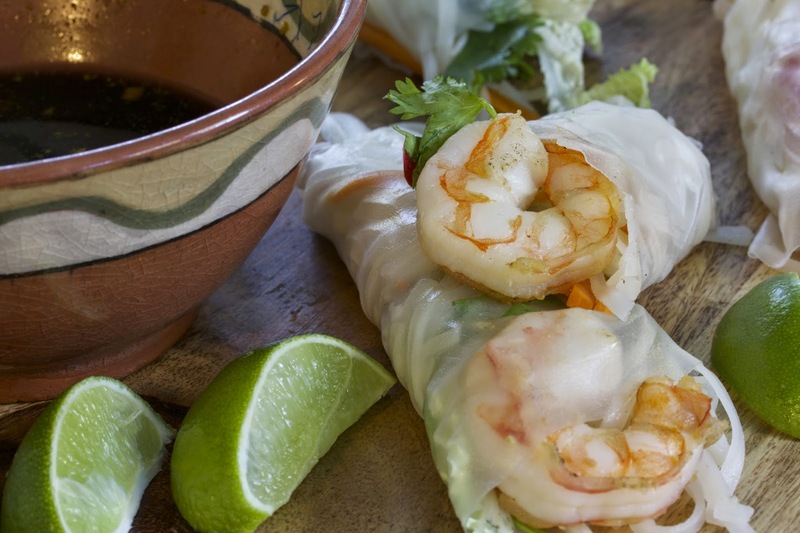 For example, I always assumed that I would either buy spring rolls at a restaurant or as take out, not realizing how easy they are to prepare - and, more importantly, how much better they taste just after the shrimp are cooked! I may have bought the wrong-sized wrappers this time - everything kept falling out - but they tasted so surprisingly fresh and delicious, we just kept wrapping and re-wrapping, enjoying every bite. 1 package spring roll wrappers, preferably 9"
1. Mix the ingredients for the dipping sauce, set aside. 2. Fill a large bowl with hot tap water. Submerge 1/2 box of the rice noodles (8 ounces total) and soak for 10 minutes, or until they are limp. Drain and set aside. 2. 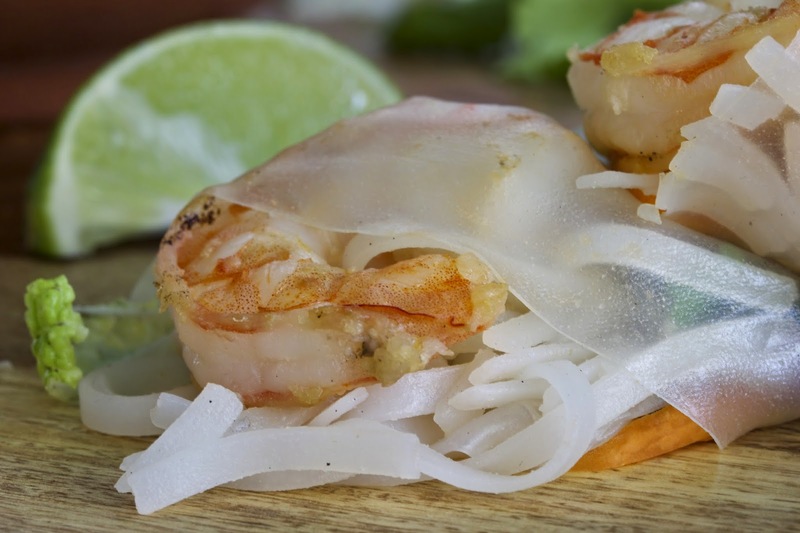 If the shell is on the shrimp, cut with scissors down the back of the shrimp, remove the shell and the tail, and rinse out the black vein. Pat dry on a paper towel on a plate. 3. Heat 1 tablespoon of coconut oil in a wok or frying pan. When the oil is hot, put in as many shrimp as fit in the pan. Fry for 2 minutes per side on medium heat, or until they have turned pink. Put these on a plate. 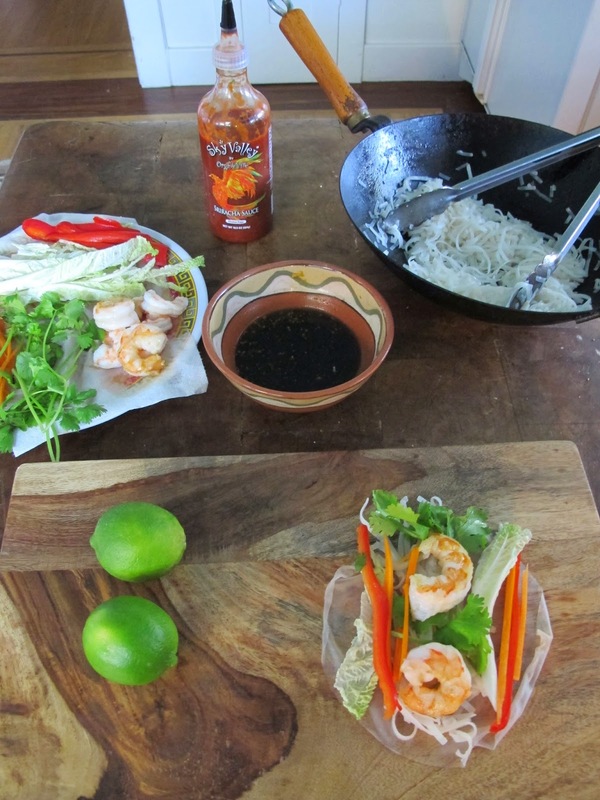 Add another tablespoon of oil to the wok, and fry the next batch of shrimp. When all the shrimp are cooked, set aside. 4. Heat 2 more tablespoons of coconut oil in the wok, and add the drained rice noodles. Stir the noodles with tongs to coat them with oil. Add the seasoned rice vinegar. Stir. Taste. Set aside. 5. Fill a large bowl with very warm tap water. Holding the edge of one spring roll wrapper, dip it in the warm water just until it starts to relax - about 10 to 15 seconds. Place the wrapper on a flat surface. The wrapper will soften up as the water left on it gets absorbed. Fill the wrapper with fillings of your choice. Fold up the bottom of the wrapper, and then roll the wrapper from one side, pushing the filling back inside as you roll it to a close. 6. Serve with the dipping sauce. Makes 8 shrimp spring rolls.